At nineteen rounds (thus the longest FIM motorcycling series) MXGP will barrel to Indonesia, Argentina, Mexico, the Netherlands, Italy, Latvia, Germany, France, Russia, Portugal, Czech Republic, Belgium, Switzerland, Sweden, and the USA before the immense curtain-dropper that is the Motocross of Nations at Matterley Basin in the UK on the first weekend of October. 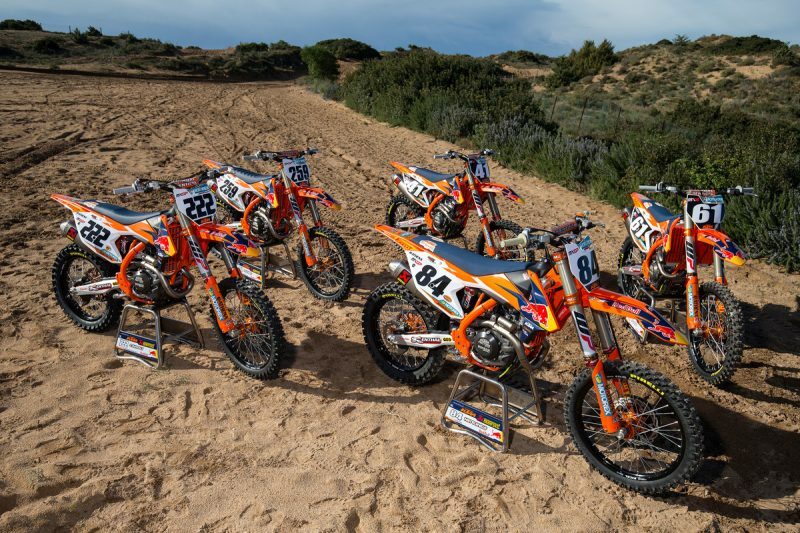 Within the MXGP (450cc) and MX2 (250cc) classes the empiric Red Bull KTM Factory Racing Team will rely on Tony Cairoli (eight times world champion and recent Italian championship winner), Glenn Coldenhoff (MXGP GP winner), Jeffrey Herlings (three times MX2 World Champ), Pauls Jonass (2015 MX2 runner-up) and Jorge Prado (podium finisher in his very first MX2 Grand Prix last summer). 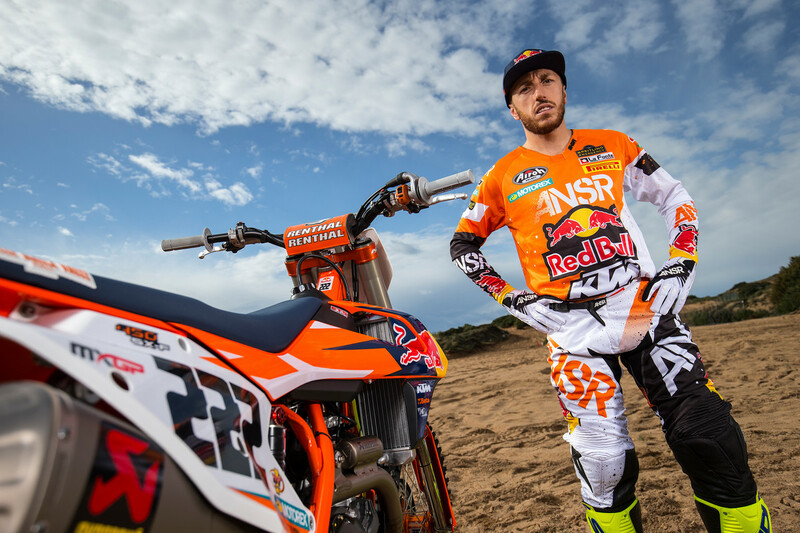 Tony Cairoli is currently 31 years old and the most decorated athlete in Grand Prix this century with two championships in MX2 and six in MXGP … but the Sicilian is still not the most experienced rider in the class. #222 began competing at the highest level in 2003, Kevin Strijbos (32 in August) had his first full GP season in 2002. Cairoli was actually the second Italian to win in the premier class since the switch in regulations to acknowledge 4-stroke technology in 2004. Former KTM rider David Philippaerts was the first in 2008. The very first winner of an MXGP/MX1 moto was Belgian Steve Ramon on a Red Bull KTM 450 SX-F at Zolder. The first rider to have won Grands Prix in both MX2 and MXGP (then MX1) classes was Ben Townley who achieved the feat by conquering MX2 with the KTM 250 SX-F in 2004 and then claiming the Spanish Grand Prix at Bellpuig on a KTM 450 SX-F in 2005. 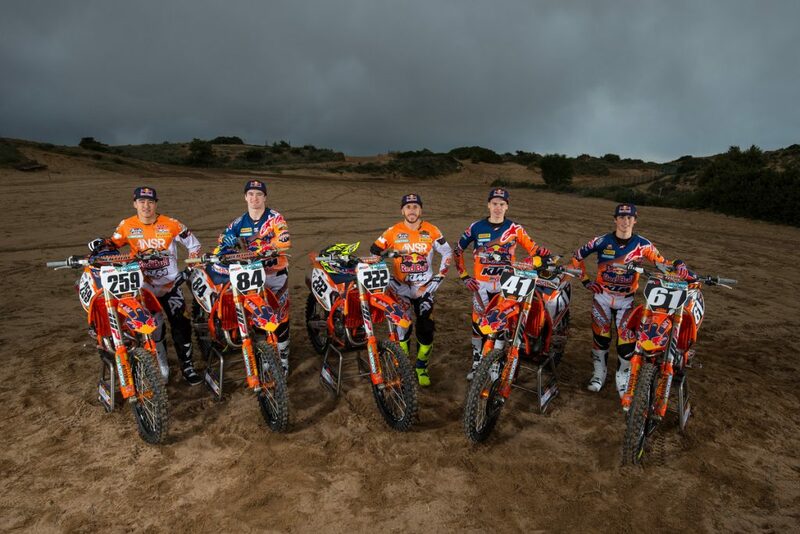 KTM have only been beaten twice since 2008 – ten seasons – in the MX2 class. The roll call of world champions with the KTM 250 SX-F reads Tyla Rattray, Marvin Musquin, Ken Roczen, Jeffrey Herlings and Jordi Tixier. Ben Townley was the very first MX2 world champ in 2004 with a version of the KTM 250 SX-F that he described as a “rocket”. “That thing was so fast at times it was embarrassing,” the New Zealander reflected in 2015. Glenn Coldenhoff is the first Dutch winner of a Grand Prix in the premier class since Marc de Reuver … who is now overseeing the training and preparation of MX2 rider Pauls Jonass. A new factor for the Grand Prix athletes in 2017 will be the use of a metal wire mesh behind the start gate; negating the need for preparation of the ground and thus more of a level ‘playing field’. Watch to see which riders and teams have done their winter homework with electronics, traction control and tire choice and expect this to be a hotspot for further tests and work by others as the season progresses. Jeffrey Herlings will make his MXGP debut in 2017 and hopefully in Qatar where he has won the two previous years in MX2 if the 22 year old can recover from a pre-season hand injury that required a small surgical procedure ten days before the race. 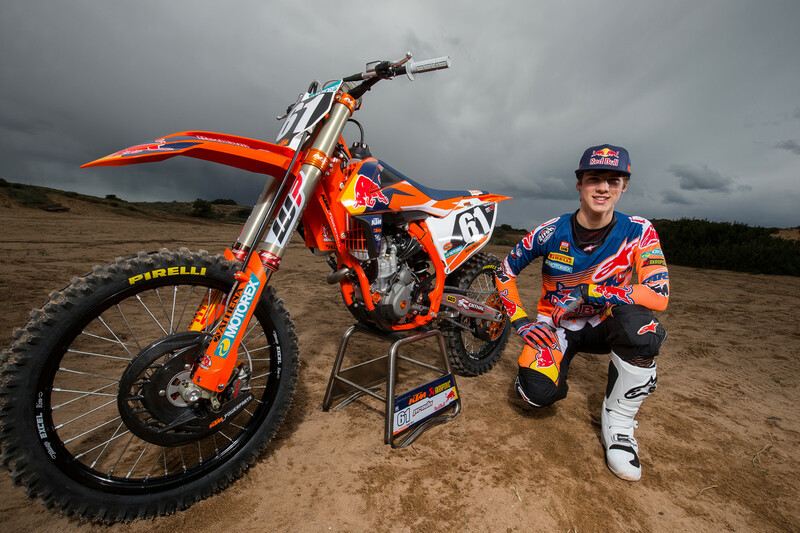 Herlings had amassed 30 MX2 Grand Prix wins from 40 appearances in the last three years. His departure from MX2 leaves a void that will prompt an exciting chase for the vacant throne and amazingly only one rider from the current crop – Husqvarna’s Thomas Covington – has experience of GP success. A total of ten riders in the 2017 line-up have walked the MX2 podium. 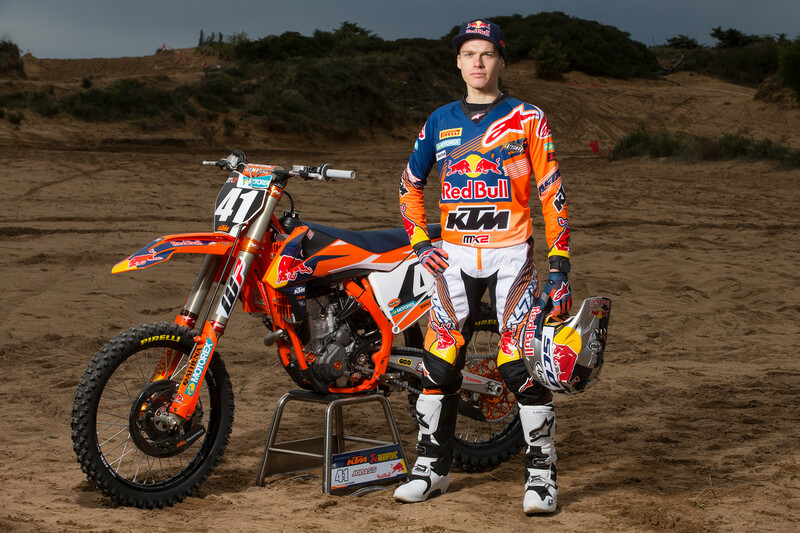 Pauls Jonass will bid to become the first MX2 Grand Prix winner from Latvia this year. He came close with six podiums in 2015 and five last season. 2017 will be the likeable 20 year old’s third with Red Bull KTM but he still has another three campaigns before hitting the MX2 age ceiling of 23. The days of the all-conquering KTM 350 SX-F – the motorcycle that Cairoli used for five of his MXGP titles – seem quiet for now. Tony dusted off the bike at the Czech Republic GP in 2016 but has been working diligently to develop the KTM 450 SX-F to his liking and should attack the forthcoming campaign on the slightly bigger model. 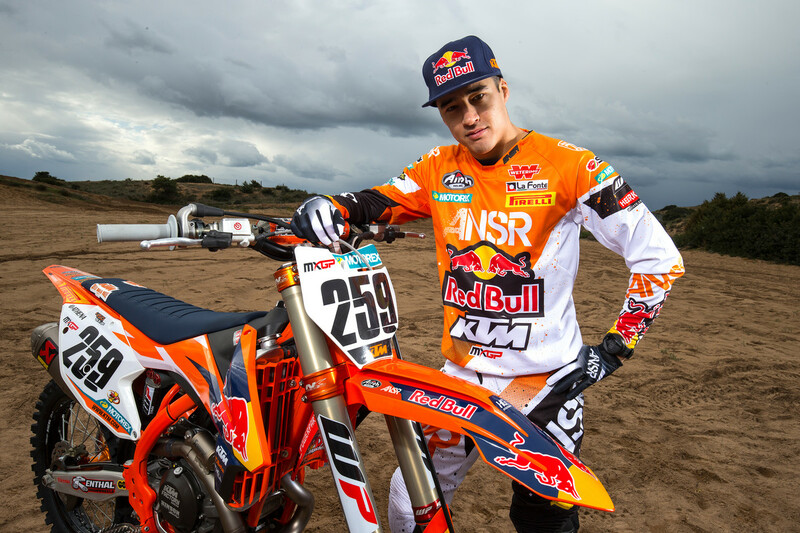 Spanish sensation Jorge Prado will make his full-time Grand Prix debut in Qatar at the age of 16 (his 16th birthday was only last month). Prado laid a tremendous milestone at Assen, Holland for round sixteen of eighteen last year by finishing 3rd overall on what was his very first MX2 race in his first year riding a 4-stroke (he had attempted practice and qualification a month beforehand in Belgium but did not make it to race day due to a prior shoulder injury). Prado’s achievement outstripped the impact of both Herlings (on the podium at his third race) and Roczen (his fifth) and hints at great things for the Belgium-based youngster. Nineteen Grands Prix will be the longest MXGP season on record, and the calendar was originally fixed at twenty rounds before the cancellation of the trip to San Marino. A total of thirty-eight motos will mean a long trek where physical peak condition will be just as valuable as outright speed. Add Saturday Qualification Heat races into the mix and Grand Prix riders will take 57 gate drops in 2017. From the eighteen round series in 2016 only two athletes in the premier class gatheredpoints in every moto; Cairoli being one. 3 Responses to MXGP – Before they ‘Go’: Did you know? Good lucka and have real fun!